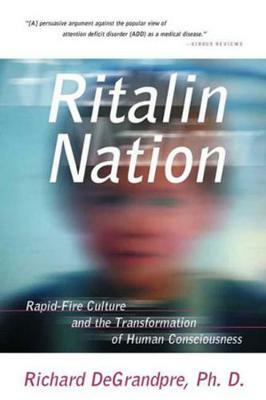 pseudoparanormal: Ritalin Nation by Richard DeGrandpre, Ph.D. This book is a good and easy read. DeGrandpre tells us about the over use of Ritalin for the treatment of ADD. The most probable cause for ADD in the time we live in is the sensory addiction. From every thing we do, to our environment and all of our surroundings state that we live a fast paced life. ADD is a syndrome not a disease because it can’t be tested. The American outbreak of hyperactivity and attention deficit can be connected with the direct and indirect effects of a hurried society (rapid-fire culture). The book talks about how our nation became a fast track country, comparisons are made from early civilization, and from the beginning of the twentieth century to the end of the twentieth century. Ritalin was prescribed in ninety percent of the cases. Psychotropic drugs are being over used and overprescribed. All children display to some extent hyperactivity. ADD cannot be authenticated by medical tests; it is a syndrome rather then a medical disorder, disease or illness. My favorite part is when he talks about rapid-fire culture: “Both leisure and slowness have been replaced for a search for excitement and speed.” Our calm and laid back tendencies have nearly vanished from our everyday lives. We tend to relax when we are on vacation and vacations don’t come to often for some. Our way of life has been accelerated and full of anxiety as DeGrandpre tells us how we became that way, through history, from a world in development, to a world with high-speed technology. As computers and cars evolve to become faster we evolve along with them to adapt. I think it can help solve real life problems or try to make them better. The concept of diagnosing a child is very delicate. The author suggest that the solution to the syndrome is trying to regain a break in our lives were you can relax. Detach from all the distractions and try to regain the real experiences. This video clip about ADHD is from a comedy show, Modern Family. I totally agree with this author!! i have never felt that it was a real disease, it was just easier to prescribe drugs to the kids people didn't want to try to handle. I think I may get this book to read.